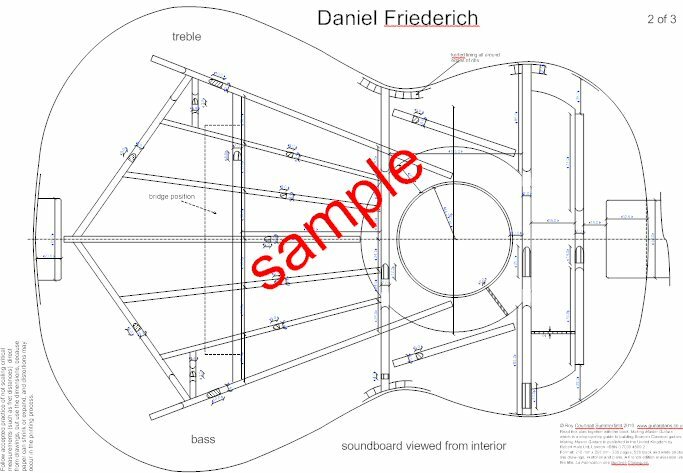 Daniel Friederich is the most famous French guitar maker of the last three or four decades - he followed on in the tradition of French guitars makers started by Robert Bouchet. Friederich guitars are now played all over the world by many of the best professional guitarists. Friederich's craftsmanship is superb, with each instrument being a masterpiece of tone and craftsmanship. He has developed several innovative strutting systems, some of which include a "bridge bar" - an idea also used by Robert Bouchet. But in Friederich's case, he has refined the dimensions of the struts and plate thicknesses to give consistently excellent results. Friederich also tests with great care, the quality of all the wood he uses, in order to calculate precisely how strong or flexible a particular piece is. This then helps him decide on the optimum dimensions for that component. The plan available here is one of his most successful designs, and enables the more advanced guitar maker to study the sophisticated design of one of the greatest master guitar makers of recent times.